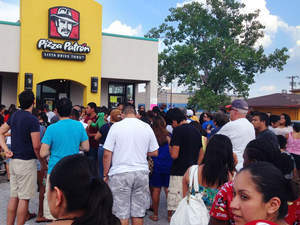 DALLAS, TX--(Marketwired - Jun 16, 2015) - The original Pizza Patrón store has been open since April 16, 1986. Despite being surrounded by more pizza and food competition than ever before, it just set the company's all-time record in an almost 30-year span. Not only did the original store hit the highest number of weekly transactions in its history, but it also saw the highest unit sales for the entire system during the week of June 1st. The store's 2015 same-store comparable sales are up 10% over last year and transactions are up 11.8% through the month of May. "This store has been around for almost 30 years. Children who grew up eating this pizza now have families of their own in the same neighborhood," said Antonio Swad, Pizza Patrón founder and president. "Our mission statement of 'Service to community. Commitment to value.' is practiced every day here by great managers and a solid crew. I'm not sure where the top is on this one, but it sure is fun looking for it." Swad explained that school-party pizza sales were a strong component in meeting the milestone and that the record week outsold Super Bowl week by 28%. "This amazing record week is evidence that Pizza Patrón is more relevant today than ever before. We are working hard to deliver on our promise of 'Mas Pizza. Menos Dinero' and these sale increases tell me that we are on the right track," said Swad.